Three-quarters of British households overfill their kettles, wasting a total of £68m each year, an Energy Saving Trust (EST) report has suggested. The study of 86,000 households also found the average shower lasted seven-and-a-half minutes. A minute less and £215m would be saved, the EST said. Washing clothes at 30C and filling kettles to the required amount were among ways to save money, it added. It said people must not think they were "powerless to control our water use". The EST found British homes collectively used nine billion litres of water a day with showers using a quarter of that and toilets using 22%. Kitchen appliances, such as kettles, dishwashers and washing machines - together with taps - also used 22% of household water, the report said. 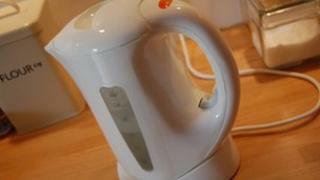 The study found 95% of people boiled the kettle every day with 40% boiling water five times a day or more. And it suggested the average household washed dishes by hand 10 times a week and used a dishwasher three times a week. The EST said bigger households could make energy and water savings by using modern, efficient dishwashers rather than washing by hand. Other ways consumers could save money included installing an "eco" shower head, it added. EST water strategy manager Andrew Tucker said that, when people thought of energy use, "they think of heating and lighting, running electrical appliances or filling the car with petrol". "It's all too easy to turn on the tap and not think about the consequences," he said. "But there is an environmental and energy cost attached to water which many people do not consider." Hot water use contributed £228 to the average energy bill, he said. "It's clear that we are all using more water-consuming appliances regularly, especially showers, but that doesn't mean we're powerless to control our water use. "By reducing the amount of water - especially hot water - that we use, we can cut down on the energy demands of our lifestyles, which have changed radically over the last 50 years."